Does the idea of creating a vision board sound…well, obnoxious? Does the very thought of cutting out a picture of a yacht from a magazine and pasting it to a posterboard with a glue stick seem ridiculous? 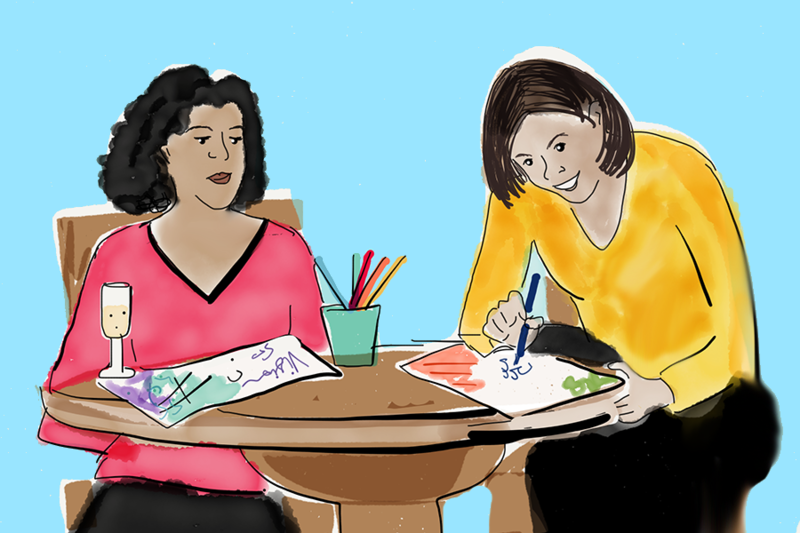 So, when a friend invited me to her house for “visionboarding” I was dreading it. In fact, I’m pretty sure I only went because there were friends and prosecco involved. What I discovered when I arrived at this party was something very different from what I expected. First of all, the vision boards participants created were beautiful, artistic expressions of internal desires. Very little of what people put on their vision boards was material at all. Instead, it was a visual statement of who they wanted to become. They made colorful prints of the lives they wanted to live. Most importantly, there was something inspiring about sitting around tables with others in aspirational conversation. People were thinking and talking about the future in a positive way, and then capturing that as creatively as possible. (Prosecco probably helped with that part.) And the more people talked and created, the more that spirit inspired me to create something too. When you capture your aspirations and put them in your daily line of sight, the reminder impacts your daily decisions. For example, if you have “I’m a freelancer living in Paris” written on a vision board , then you will be much more likely to say “yes” to an evening with a French cultural group when a friend invites you. You will also start to notice freelance opportunities that come your way. You might remember to practice your French with Duolingo more often. Or set up a price alert for cheap flights to Paris. The frequency of the reminder makes your dream feel more possible, as it prompts you to envision yourself living your desires. Think of the vision board as a cue card for your subconscious to take you in the direction you want to go. Not only that, but obnoxious or not, the reason vision boards are popular is because they are effective. Ready to try it? Here are 7 methods of vision boarding that won’t require scissors and a glue stick. Poster board is hard to beat for scale and affordability. The advantage to choosing this format is that your vision board will be large enough that you will notice it. The expansive canvas also gives you more room on which to express yourself. You can let your inner creative run wild. If you enjoy the look of a chalkboard, Chalk ink markers allow for precision as you write words and embellish. Using a chalkboard as a vision board is easy because you can make a mistake and quickly redo. Another benefit to the Chalk Ink Vision Board is that you can erase it each year and begin again. Vision boards don’t have to be elaborate. In fact, they can be limited to a few sentences. Core statements about who you most want to become. You can write the words out in whatever format you like, or create something changeable, like this dollar store silver tray with magnetic poetry attached. No matter how you choose to display the words in your environment, the important part is that you see them daily. Vision boards don’t have to be artistic, they simply have to be visual. You can even use a single photograph. Want to change your profession from whatever you are doing now to something that is a better fit? Find a photo of someone working at your dream job and post it to your mirror. Is there someone you really admire and want to be more like? Find an image of them and put it in the place you will see it every day as a reminder of the changes you are making. Futureme.org is a service that allows you to send emails on delay to yourself. You can craft e-mails that congratulate yourself on achieving your dreams and delay by a year, or send on a specific date. This is powerful. You craft the text while thinking aspirationally about your future, then are reminded of it suddenly in the context of a normal day at a time period you specify in the future. When using this service in a vision board context, you will want to craft to send 6 – 12 different times during the year, so that the reminders are frequent enough to focus your thoughts on where you are going. There can also be serendipity to this. It isn’t uncommon to forget that you’ve set this up and receive the email you’ve sent yourself on a day when you really, really need it. Have photoshop skills? Take the time to photoshop yourself into the life you want to live. You can put yourself in the location you want to vacation. At a graduation ceremony. In the place you want to work. On the stage you want to speak on… The possibilities are endless. Digitally crafting your image can create more realism in the result which can be a powerful subliminal cue, but it still works even if it is obvious that the photo isn’t 100% real. You can also set it as the screensaver for your laptop or phone. You don’t have to be “an artist” to play with paint on your vision board. In fact, you might find it a freeing way to express yourself. You can practice and just roll with whatever happens on the canvas. Because a vision board is something you create for yourself, you don’t have to worry about who sees it. While you can use any of these methods on your own, I highly recommend going through this exercise with friends. There is something to the positive energy of creating together that not only makes the experience much more fun, but also more effective because you wind up asking each other frequently about your progress.